Millennials…glued to their phones, posting everything to social media and spending more time on the internet than preceding generations. Yes, these are quasi-negative stereotypes, but that doesn’t mean you should engage them any less than other workforce generations; nor are they the only generation to use their mobile device frequently. In 2017, 56 million Millennials (those ages 21 to 36 in 2017) were working or looking for work. 75% of US adults use a smartphone and global phone usage is expected to surpass the 5 billion mark by 2019. In other words, as these phone-focused candidates begin to take over candidate pools, use this stereotype to your advantage in recruiting. Some companies use interviews as an opportunity to reach out to candidates, others use surveys during the recruiting process. Still other organizations take candidate engagement to a whole new level. They use the impact emerging technology on workers’ tendencies toward mobile engagement and reach out to them via text messaging. First, you have to understand those in your talent pool who use their cellphones on a regular basis to communicate. With all of the articles about how to attract, engage and retain Millennial talent, one might believe they are the only generation out there to recruit. While they are known as highly mobile candidates, they aren’t the only ones who use their phones and tablets to communicate. Perhaps not so unusual, 79% of candidates between the ages of 18-44 (yes that includes Millennials and Gen X) have their cell phones with them 22 hours of the day. Assuming that Millennials are the only generational candidate demographic as comfortable with their cellphones as fish are in water is not only faulty, but potentially detrimental to your mobile recruitment strategy. 68% of Millennials, 73% of Gen X-ers and 75% of Baby Boomers are willing to receive job opportunities via text. So remember that texting candidates can open up entire worlds of talent, not just entry-level folks or Millennial-based talent. More than 78% of recruiters use text messaging to schedule interviews. More than 76% of recruiters use text messaging to confirm these scheduled interviews. 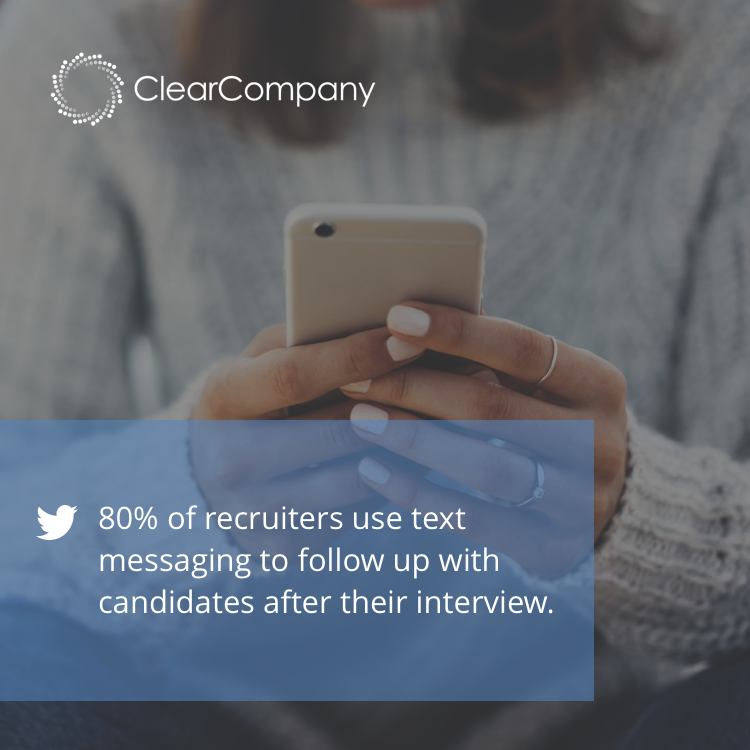 Furthermore, 80% of recruiters use text messaging to follow up with candidates after their interview. Considering 81% of those who own a cellphone use them to text, it is an easy, quick, and efficient way for recruiters to contact their candidates. The question then is: do you lose quality face-to-face contact when your organization perpetuates digital communication? It’s not an uncommon practice for recruiters and candidates to communicate through text; in fact, 31% of them do so. The third point to consider, then, is the amount of time during the hiring process spent on a mobile device. You have to decide what kind of communication and how much of it you are willing to divulge to SMS. In most cases, SMS is not trackable, thus it’s difficult to report the efficacy of using text messaging to further candidates through the recruitment funnel. It largely depends on the talent pool. A predominantly younger demographic - i.e., Gen X and Millennials - would be more receptive to texting as a means of professional communication. A combined 43% of job seekers consider text messaging to be professional communication while 32% deem text messaging unprofessional. On the other hand, 19% say it is slightly unprofessional for recruiters to text job seekers. So, recruiters largely have to understand the industry, the company culture and the demographic of their candidates to decide whether or not SMS is a viable addition to their mobile recruitment strategy. One great way to find out is to offer the option to candidates themselves. Add mobile and SMS options to your job ads, or take a closer look at the traffic your website receives from mobile users. Recruiters understand the proclivity towards text messaging, but choosing to add it to the recruitment strategy has many other factors involved. 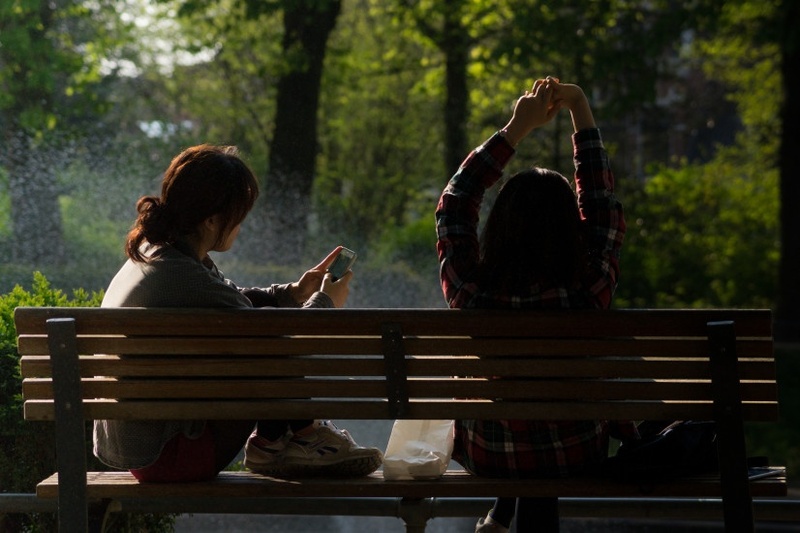 It is important to recognize that while Millennials have the mobile-addict stereotype, they are not the only a working generation who uses their mobile devices frequently. Recruiters can also use an SMS strategy to engage Gen X candidates, as those under the age of 45 see text messaging as acceptable professional communication. Mobility is clearly a staple in the world of recruitment, but it’s your job to decide whether SMS is a viable addition to your mobile recruitment strategy. 1. 89% of job seekers think mobile devices play a critical role in the job hunting process. With the advent of mobile recruiting platforms (apps, mobile applications, etc.) getting on board with some form of mobile recruiting technology can drastically improve the competitive advantage of your business. How? Because it’s technology they’re already using. They text, call, FaceTime, Skype, network and manage their lives all on their mobile devices every single day. Candidates want quick responses and fast progression. The long response times between emails just won’t cut it anymore. They already believe mobile technologies are important to recruiting and talent acquisition, so why not implement it? This is why our team is so excited about the launch of ClearText. You can text candidates and maintain logs of your conversations with them from the moment you hit send. You can get to know candidates and set up interviews in a fraction of the time traditional recruiting methods would take. 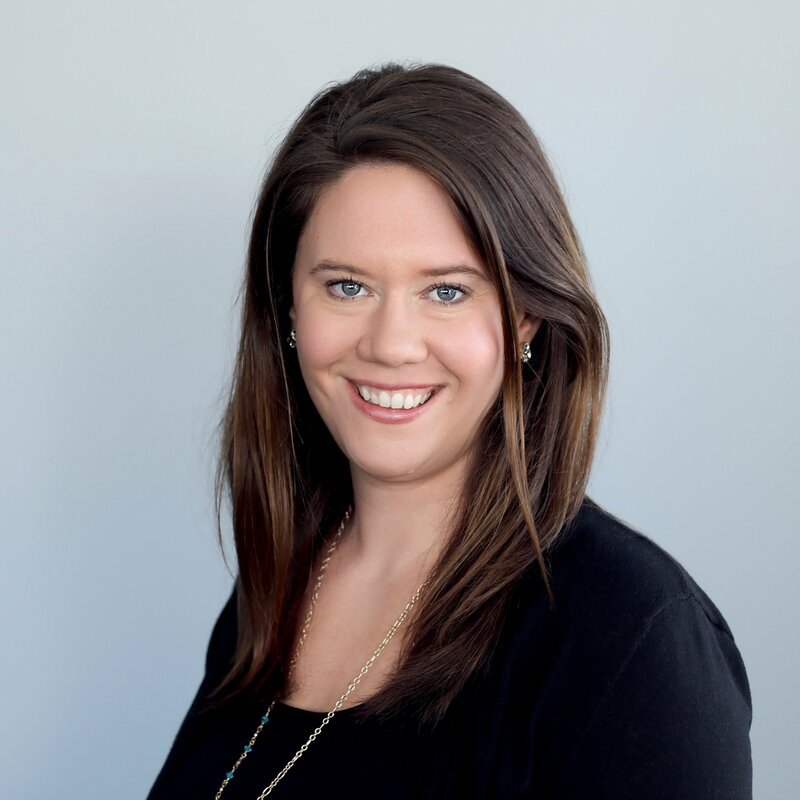 In other words, not only are you communicating with candidates faster and on the channels they prefer, but you’re also establishing the foundation from which you can create a better, faster recruiting process. 2. 65% of job seekers use their smartphone at least once a day for job search purposes. Let that marinate for a second: 65% of your future great employees are already searching for your business on their mobile devices. Sure, you could continue to create job board postings and advertisements, but also incorporating a messaging framework around texting candidates puts you directly in the palm of their hand – it creates a direct connection to talent. More importantly, it makes your business appear more approachable. With ClearText, you don’t have to use your personal cell number. The software uses anonymized phone numbers (similar to Uber or Lyft) so recruiters and hiring managers can retain their privacy while still connecting with candidates on a personal level. 3. 78% of candidates who own smartphones would apply for a new job through their mobile device. In today’s candidate-driven market, appealing to a candidate’s lifestyle is more important than ever. Presenting yourself as a business that suits their needs will help distinguish you from the competition. Doing so is crucial since 42% of employers say they’re experiencing a talent shortage. However, texting candidates is more than just appealing to their interests or their lifestyles. It’s about establishing yourself as a progressive employer that consistently seeks to improve the way you recruit and conduct business. ClearText integrates with our complete talent management platform so you have everything you need to hire, retain and engage more A players. 4. 73% of job seekers prefer to receive targeted job opportunities via text. Candidates want texts. Period. It simplifies their search and helps them connect with employers (and jobs) faster. It’s about pace, functionality, but most importantly user experience. Candidates want to receive job opportunities in a way that fits their needs and their lifestyle. They don’t want to trudge through job boards on their laptops for weeks just to anxiously wait for one email response from the dozens of applications they submitted. Candidates want to feel connected to their potential employers right from the moment they hit the “submit application” button. 5. With a 98% read rate, texting potential prospects will ensure job postings are seen and reduce the amount of time spent exhaustively searching for suitable applicants. Probably the most important statistic to sway any business to text recruiting is the open rate: candidates read their texts. In fact, nearly every smartphone user reads their texts right away whether they’re applying for jobs or not. How does this influence your decision? First, there’s a 98% guarantee your messages will be read. Second, emails only receive an average 20% open rate, meaning it’s quickly becoming an outdated and unproductive recruiting method. In other words, text recruiting technologies like ClearText will speed up your recruiting, create connections with candidates and improve the recruiting process with nearly 100% open rates. Text recruiting is a surefire way to increase recruiting efficiency.